The bootloader automatically adjusts at start to the hosts baudrate, so that it is not necessary to recompile the bootloader to a particular MCU clock. There exist precompiled hexfiles for different controller types and probably different UARTs, which work independently from MCU clock. 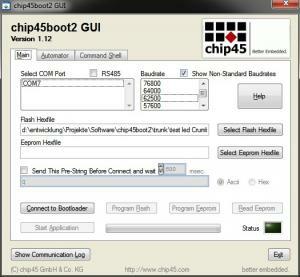 The chip45boot2 GUI is a comfortable PC/Windows application with a graphical user interface for the bootloader, which simplifies flash and eeprom programming over a COM port. Similar to the precompiled bootloader hexfiles, the chip45boot2 GUI can be downloaded below for free. If you want to use the PC software for a customer project, we can build a customized version for you (your company logo and name instead of chip45). Please contact us in case this is of interest for you. For Mac users a native Mac OS X user interface application is available at www.definefalsetrue.com. The page currently is available in german only, but the download link can be found easily and the actual application is in english. Thanks to Steffen Fuchs for programming this great application! A nice command line frontend for Linux users was contributed by Torsten Martinsen and can be downloaded at https://github.com/bullestock/c45b. new: support of RS485 half-duplex communication!!! graphical Windows user interface chip45boot2 GUI for comfortable target programming from PC! In case your desired AVR controller is not listed, write us an Email and we will provide a new hexfile as soon as possible. This service so free of charge for you! Further informations are available in the Infosheet. The precompiled hexfiles may be used for either commercial or non-commercial projects and products without limitations. In case you want to extend the bootloader by own functions or make changes to it, you can buy the sourcecode (for Atmel Studio with AVR GNU Toolchain) in the shop. V2.9P: changed app_start(); call for start of application, since latest avr-gcc (Studio 6.1) doesn't generate a proper jmp to address zero. V2.83: Changed welcome message, version number is printed now. New controllers. V2.82: Changed line ending from '\r' (0x0a) to '\n' (0x0d) and several new microcontrollers.